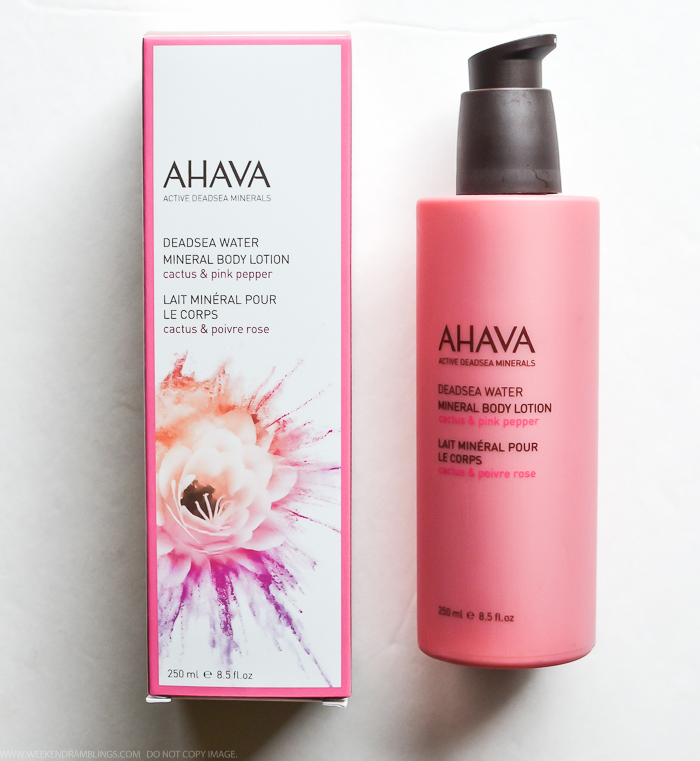 AHAVA Dead Sea Water Body Lotion is a light, fast-absorbing moisturizer with a lovely soft floral scent to it. The lotion leaves skin feeling moisturized and hydrated without any greasy residue. It feels so light on the skin, I was pretty sure I would be feeling dry and itchy in no time, but it quite surprisingly moisturizes my skin for the entire day - and I have quite dry skin. 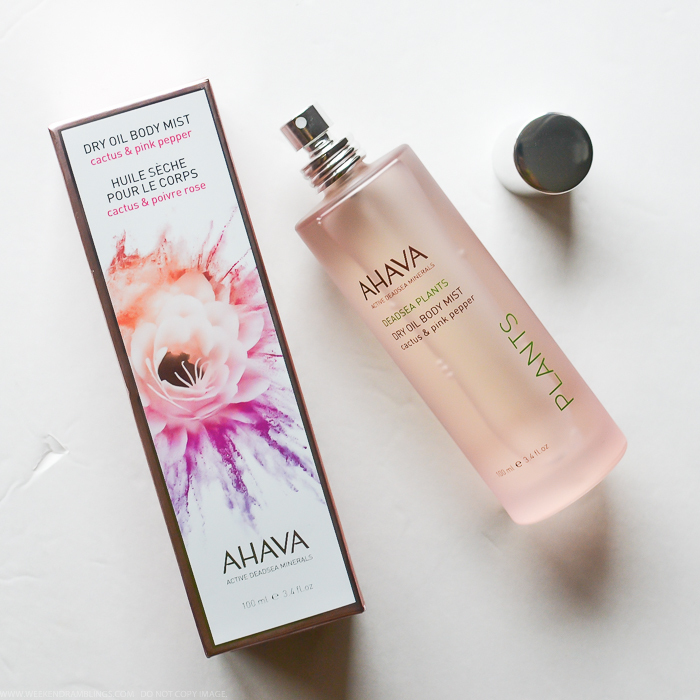 I still tend to reach for a heavy-duty body butter for my hands and feet, especially during the night, but for a quick but effective daytime moisturizer the AHAVA Dead Sea Water Body Lotion is perfect. I can never have enough hand creams, and the AHAVA Cactus and Pink Pepper Hand Cream is a welcome new addition. It's light and nongreasy and absorbs in a jiffy, leaving hands moisturized and soft without any trace of oiliness. 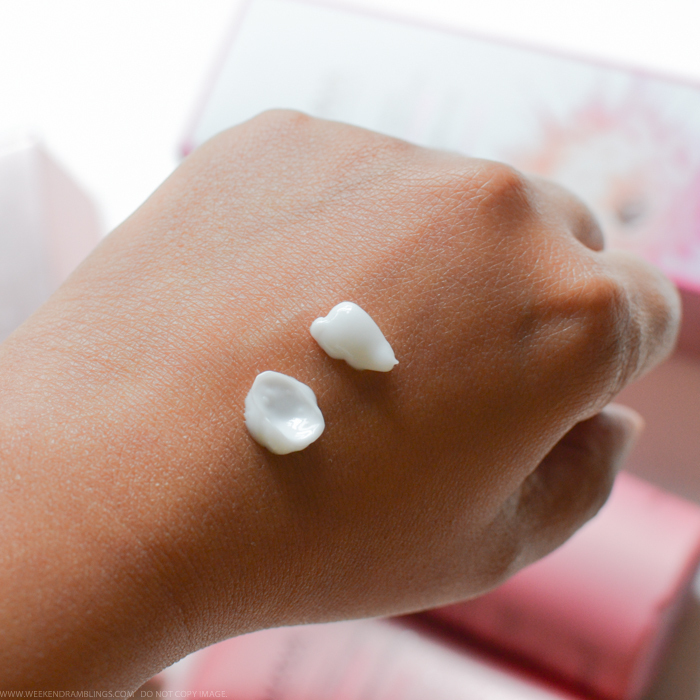 I have very dry hands, and ideally I would stick to using heavy, greasy creams on my hands, but they aren't always the most convenient - leaving oily residue on anything I touch - so for the daytime, I prefer fast-absorbing moisturizing hand creams. 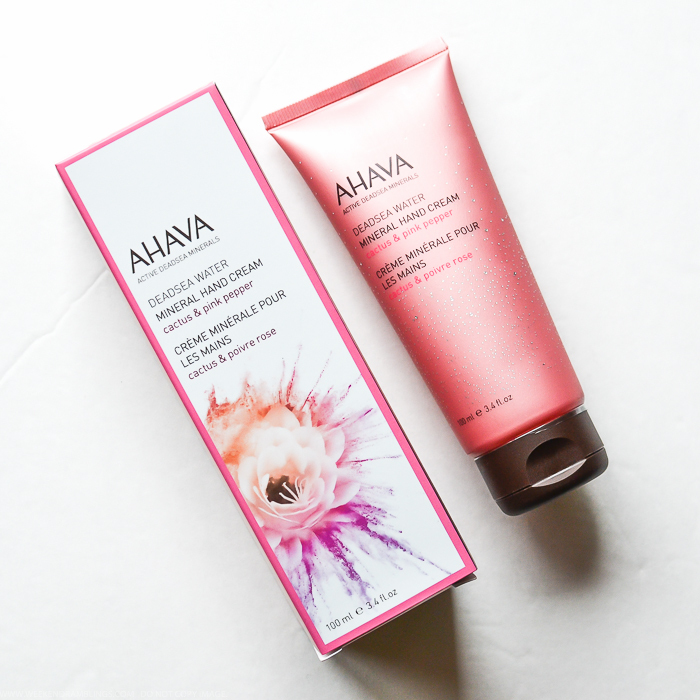 AHAVA's Dead Sea Mineral Hand Cream fits the bill perfectly and is a convenient option to carry around in my bag. As part of the Breast Cancer Awareness month, 20% of all proceeds from sales in October of the AHAVA Cactus and Pink Pepper Hand Cream will benefit the National Breast Cancer Foundation. AHAVA Dead Sea Plants Dry Oil Body Mist is my favorite product from the entire collection. This dry oil mist combines moisturizing oils like jojoba seed oil, sesame seed oil, and vitamin E with dead sea plant oils to leave skin feeling smooth, supple, and radiant. To use, spray a fine mist of this ultralight oil on to the body and smooth into the skin. The oil feels quite light and absorbs really fast, and since I don't apply too much of this mist, I don't have to worry about it leaving any greasy residue on my clothes. Apart from how smooth and soft my skin feels, I also love how quick and easy this makes my daily moisturizer routine. A few spritzes of this body mist, and in about 5 minutes I am done with my dose of moisturizer for the day. This oil does have the same floral fragrance as the other products in this range, but perhaps because of the oil content, it does seem to a little heavier than the lotion or hand cream. 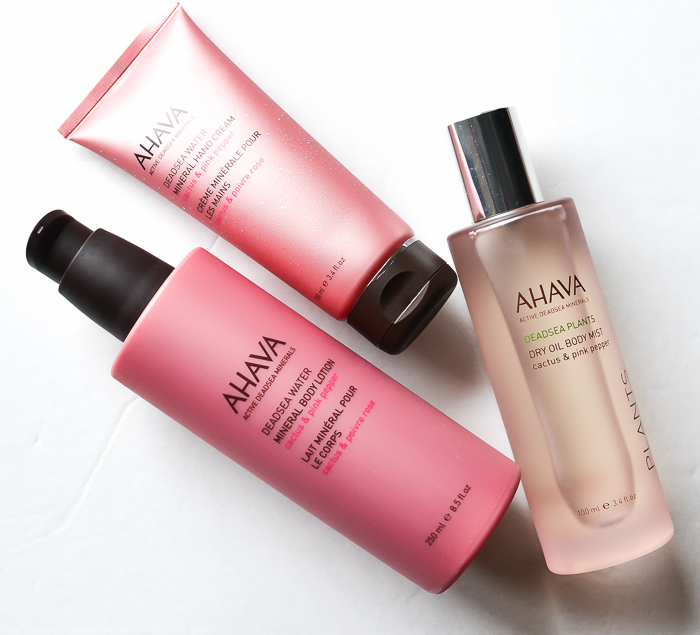 Overall, the AHAVA Cactus and Pink Pepper Collection has been an awesome addition to my skincare routine. 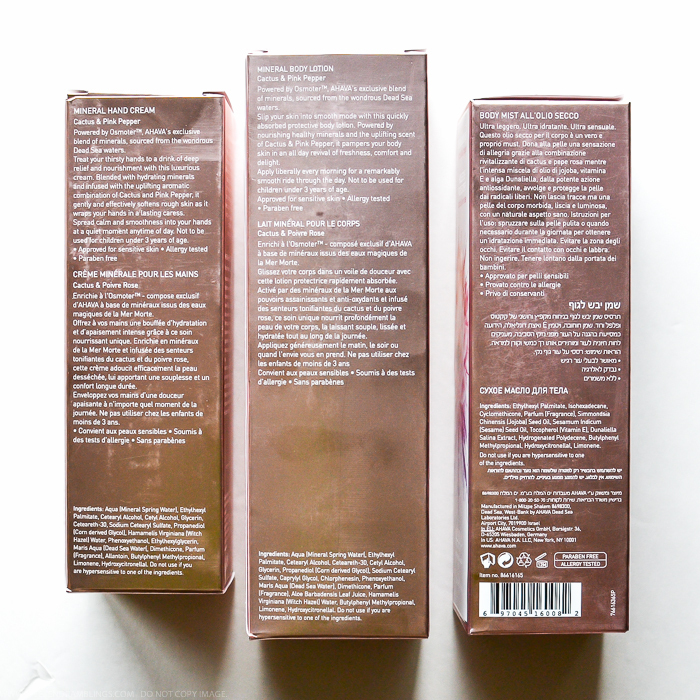 I love the soft floral fragrance and the gentle hydration that these products provide. Do give these a try if you are looking to add a little pink to your skincare this month.